An all-around team traveled to Leipzig including export managers from all our active countries, commercial director and the CEO to cover all business opportunities; also technical director and product manager to cover any product inquiries, technical demos and clinical trials. 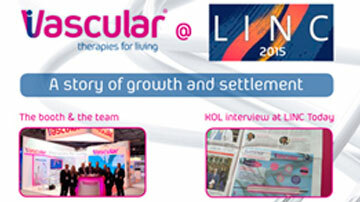 An interview at LINC Today involving 3 of the most important KOL in the vascular field (Dr. Vicente Riambau, Prof. Dr. Ülf Teichgraβer and Prof. Dr. Dierk Scheinert) commenting the state of the art of DCB therapy, iVascular’s new coating technology Transfertech and the forthcoming EffPac clinical trial. The self-expanding nitinol stent “iVolution” was officially launched with daily product demonstrations, showcases of recorded interventions and the display of new tools for our sales force (brochures, case reports, demo videos, wall visuals and more). Final details of the forthcoming EVOLUTION clinical trial for iVolution were discussed in the meeting with its principal investigator, Dr. Marc Bosiers from A.Z. Sint-Blazius Hospital in Belgium. The objective of EVOLUTION will be to evaluate the short-term (up to 12 months) outcome of treatment by means of the self-expanding nitinol stent iVolution in symptomatic stenotic or occlusive lesions (Rutherford 2-4) in the femoropopliteal arteries. The study, starting next February, will enroll 120 patients in 4 centers in Belgium. The EffPac trial for iVascular’s DCB luminor was officially presented to the audience by its principal investigator Prof. Ülf Teichgraβer and Dr. Sebastian Sixt. EffPac is a phase III multicenter randomized controlled trial to assess the effectiveness of DCB luminor versus POBA in the SFA and popliteal artery to prevent vessel restenosis or reocclusion . The trial, starting next April, will enroll 172 patients in 9 centers in Germany including Prof. Dr. Dierk Scheinert’s group in Leipzig. A live case of luminor was broadcasted at the Main Arena from the Park Hospital & Heart Center in Leipzig by Dr. Schmidt. A total occlusion in the left SFA was treated with atherectomy followed by iVascular’s DCB luminor 35 with a successful outcome for the patient. Thanks to all of you that help to make it happen and see you next April at Charing Cross Symposium in London.